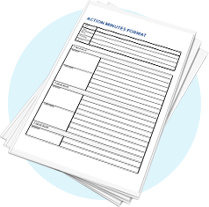 When taking minutes or notes for a meeting there are several minutes formats available for you to choose from. Minutes are supposed to be the official written records from your meetings. 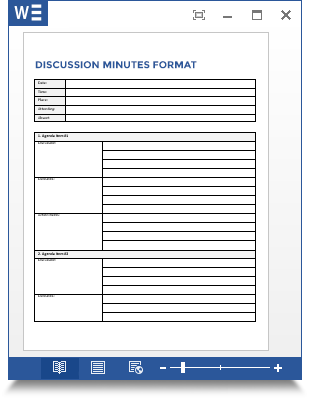 Minutes or protocols should not be a record of the discussion that took place but more a consensus or decision for each topic discussed (unless you are using verbatim minutes). 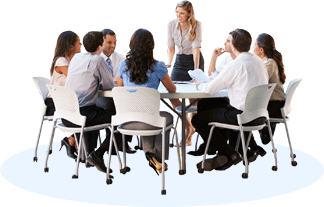 The minutes layout you choose can depend on the formality of your meetings and culture within your organization. 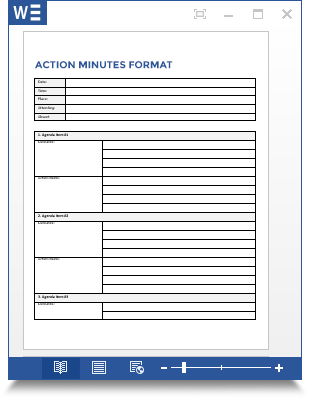 Here is a short description of some common minutes formats and minutes templates. Verbatim minutes are a word for word written transcript of who stated what during meetings. Verbatim minutes are often very lengthy and difficult to overview. They are rarely used unless required by law, in public hearings or congress. Capturing verbatim minutes is difficult for the note taker and recording the conversation with a microphone could be very helpful for proof-reading minutes. As opposed to action and discussion minutes, verbatim minutes focus on individual’s comments and not the general consensus.